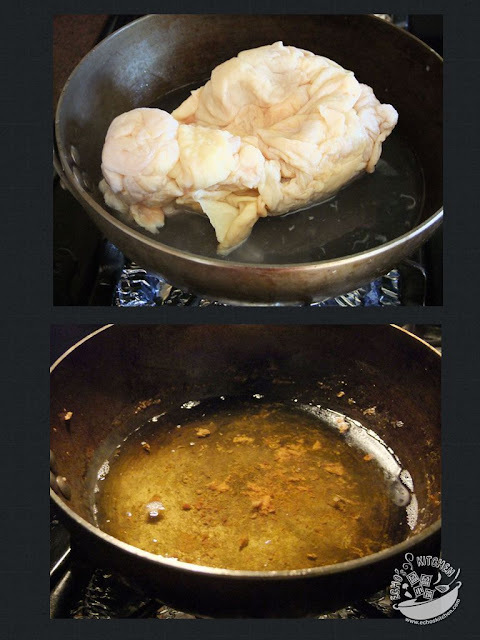 The process of rendering chicken/poultry fat is pretty similar to the making of Pork Lard. The only different will be that I do not cut the chicken skin/fat into small pieces. Once the fats are all rendered out, the crispy chicken skin is a very tasty snack, of course you can also throw it away if you are worry about calories and cholesterol. 1. Cleaned the skin & fats thoroughly. 2. In a cookware/wok, add 1 cup of water with all the skin and fats, bring to boil and continue cooking at medium heat until water evaporate, turn to low to render all the fat out of the skin and fat. 3. Stir occasionally until the skins become crispy and oil rendered are cleared. 4. Separate the crispy chicken skin with the oil rendered using a sieve, sprinkle some salt on the crispy skin, it gives better taste and preserve it longer. 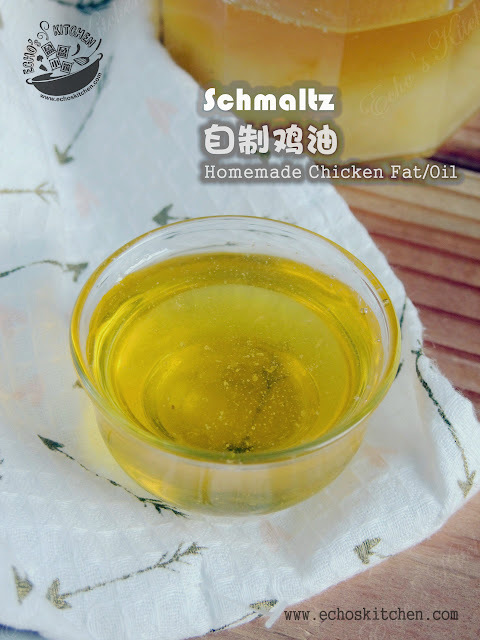 Adding water is important, it is the key to make clear schmaltz. That too, is another reason not to waste the fat... welcome to my blog!